The University of Northampton Enterprise Club invited me to present ‘social media for the bemused, confused and unenthused’ to their members. Having been to a previous meeting I was expecting somewhere around 25 people, but arrived to find in excess of 50 on the list. 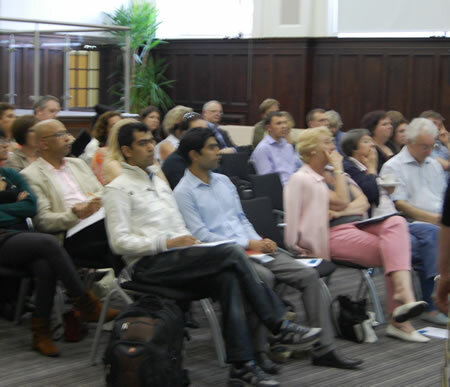 The venue was the impressive Newton Building, with surroundings more in keeping with a luxury hotel than a University. Venues weren’t like that when I did my degree! What I found most interesting about the evening were the range of businesses represented, from refrigeration to clothing designer, computer software to a theatre company. It’s so pleasing to see that the word is really spreading to all business sectors about the need to gain an understanding of just how and where to start using social media, as inbound marketing, in addition to commonly used methods referred to in the presentation as outbound marketing. Because there’s always such a range of technical experience in the room I really try hard to make these presentations non-technical. I always say that it’s the mark of a good teacher to be able to make information accessible to those with little or no knowledge, whilst keeping the attention of those who understand the concepts you’re talking about. To that end I explained various acronyms, in plain English, as I spoke about them. However, afterwards I found I’d tripped up by not expanding on SEO, search engine optimisation for those who don’t know. Because I deal with SEO on more than a daily basis, I fell into the trap of assumption that “everyone knows about it”, which they obviously don’t and didn’t. It’s also the mark of a good teacher to apply that old maxim after every presentation, “must try harder”. So I will…! Having said all that, I think the audience grasped the concept of engaging and quality content = social signals. Now, if you don’t know what social signals are then I’m afraid I’m not going to spell that one out fully here. Drop me an email, follow me on Twitter @SusanCollini or ask a question on facebook.com/websitewings. There’s a clue to what creating social signals is about. The engagement of the audience during the presentation was good, as was the interaction afterwards both before, during and after the tasty buffet we were provided with. As a follow-on there will be a series of Autumn workshops covering best practice to getting a business presence online, blogging and social media. Contact me for more details. Other posts which might be of interest. Thank you for your informative talk. I found it really interesting, especially as I have just started the web presence for my business only last week. I will now try to ensure that social media plays an important element in engaging with my customer base. Great stuff!!! Thanks for your kind feedback, so pleased to have helped. Maybe consider joining in with one of the Social Media Huddles held at The Derngate? Go to the Social Media Huddles page for more information and booking details for your free ticket.